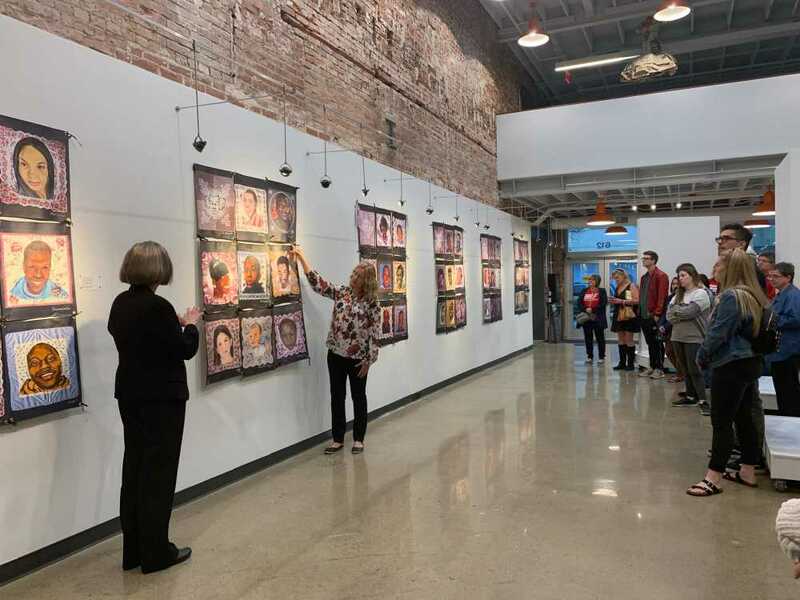 Faces Not Forgotten Project showcased quilt portraits of children, all under the age of 20 from St. Louis, who have died in a result of gun violence at Catapult Creative House on Friday, Apr. 5. The Project was started by artist Christine Ilweski, who suffered a personal loss to gun violence which provoked a passion to devote other artists and herself to put a face to the young victims. Ilweski had a friend who was a priest and had been active in social justice events his whole life. He was murdered two days after his 75th birthday, which helped her determine the change and awareness that she wanted to tell the world. Lynda Stewart (Left) and Christine Llewski (Right) reading the names of victims of gun violence. “I came across a story of a young man and I asked if I could do a painting for the family because I feel that portraits give them dignity and elevate their status in real life,” Ilweski said. Ilweski said artists volunteer their talents to paint portraits of victims, and all original painting is the wishes the families to commemorate their loss. This project was renamed Faces Not Forgotten by artist Bill Burton. The name addresses the wishes of the victims' families of their children to not be forgotten. “These are untold stories of children that are dying across the U.S. every day that are under the age of 20, as the result of many different types of gun violence. There is suicide, domestic violence, accident and essentially being at the wrong place at the wrong time,” Ilweski said. Kaleigh Oliver, a junior at Southeast, said art is not typically shown in this way. 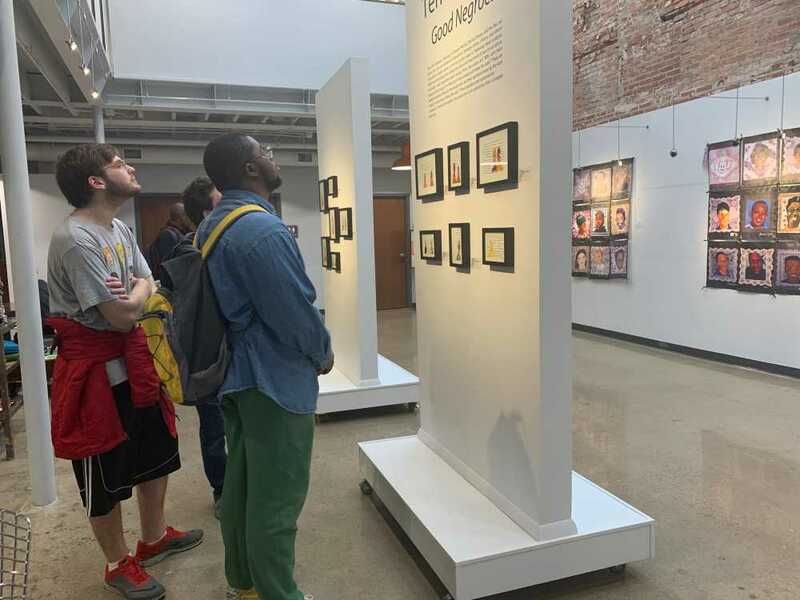 “I think people see art as something beautiful and meaningful, so seeing those people displayed in art on the wall shows the vast amount of people who had their innocence and life taken from them,” she said. Another student, Allison Wankum, said social justice issues like this aren’t talked about in Cape Girardeau and bringing light to how life-threatening this is in many other cities as well. “It’s probably good for an area like this, where it’s really rural and we don’t see a lot of gun violence,” Wankum said. So just announcing that this is happening and that it is still an issue is good to bring up,”. Taylor Davis, an attendee of the event, said that people need to know that the artwork speaks for itself. “You don’t need a voice for something to speak,” Wankum said. The pictures out there, they speak and people are able to make an emotional connection with them,” she said. Reaching the community is important in spreading the word about these issues. “I just want to see communities coming together and realize that this is bigger than you,” Davis said. This affects everyone, it affects families. The other people we don’t talk about -- people actually pull the trigger --it affects their families too,”. The host of Faces Not Forgotten, Southeast Missouri chapter of Moms Demand Action For Gun Sense In America will be decorating care cards for gun violence survivors from 9 to 11 a.m on Saturday, Apr. 13, at Catapult Creative House.